Triska is a striking Siberian Senior with a sad tail… For unknown reasons she found herself at a shelter and very depressed. 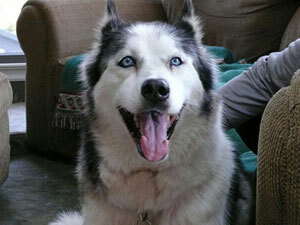 No sooner than Triska came into MaPaw and started settling in, seizures began. We are very happy to report that she is now regulated with Phenobarbital, an inexpensive seizure medicine, and is currently seizure free! Paws crossed! Triska has been through a lot and was very sad when we first met her. We will never know her past and it has taken months of devotion and love, but Triska is now a happy girl. She loves walks and visiting parks and has a beautiful voice. She will gladly join in any discussion, especially “when is dinner?”. Triska has now been diagnosed with Cushings Disease and this has been more challenging and expensive to treat. She has been placed on a new medicine, Trilostane, which we are hopeful will stabilize her. This wonderful girl has come so far and has blossomed into a sweet and sassy senior and we are happy to be able to help her with your help. It does come with a hefty price tag, in 13 months her bills and medicines have exceeded $5,000.00. Knowing she is happy and will always be so ~ priceless!